The Riviera Resort Main Lodge was built in 1889! We have kept the traditional resort atmosphere with a modern touch, creating a year round vacationers paradise. Come create memories which will last a lifetime. You may come here as a stranger, but you will forever part of “The Family”. View of Main Lodge from East Bay of Houghton Lake. Rooms, Apartment, Executive Suite located on Upper Floor. Beach house located on lower level with private balcony. All rooms have balconies with a beautiful view of the lake. Our lovely cottages come with a living room, dining room, kitchen, cable, sleeper sofas, and much more. Each studio is 1200 square feet and can sleep up to 6 adults. Relax with your own private balcony overlooking the lake. 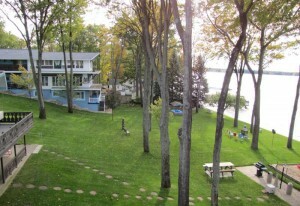 Our beach house offers a spectacular view of the lake. Gas BBQs, picnic tables, sitting benches, 100ft dock, large sand box play area, rowboats, moorings for jet skis and boats, game area and sandy lake bottom! 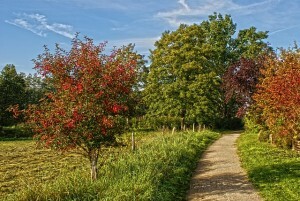 Enjoy a nice walk through the local nature & hiking trails. Soak up the sun while enjoying Northern Michigan’s wildlife. 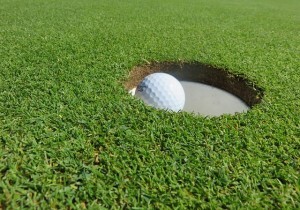 Riviera Resort offers great golf packages that include some of the best courses in the area. Save money on golf while staying at our resort. The Riviera Resort has hosted many special events including weddings, birthday parties, and reunions. Our location is the perfect destination for family gatherings and fun.